Hannibal - NBC's new series based on Hannibal Lecter and other characters from the novels of Thomas Harris - has a daring premise: exploring the motives and methods of "Hannibal the Cannibal" in his time leading up to the events of Red Dragon. There is an execution to this show that rivals that of cable series such as The Walking Dead and Game of Thrones. It is grisly and gruesome and graphically disturbing as anything about Hannibal Lecter should be. But having just finished watching the pilot episode ("Apéritif") I find myself wondering how much ... or how at all... I would commit to continue following this series. The acting quality in Hannibal is premium. Hugh Dancy is compelling to watch as FBI Special Investigator Will Graham: a forensic profiler with a talent for getting into the minds of serial killers. Laurence Fishburne - always a welcome measure of gravitas - is performing admirably as Special Agent Jack Crawford. And then there is Mads Mikkelsen as Dr. Hannibal Lecter. And he's definitely bringing all the right elements of Lecter to the table: his sophistication. His cold demeanor. His skill as a gourmet. The subtlety of his evil. 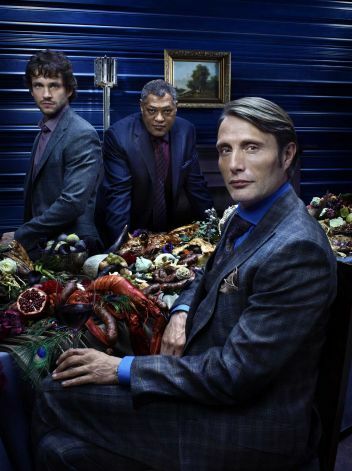 The problem for me is, Hannibal seems like a melding of too much other television that we've seen before. The BBC's Sherlock comes most to mind. Imagine Martin Freeman's Watson from that show with Sherlock's overwhelming deductive abilities and driven nature. But instead of "consulting detective" Sherlock his flatmate is "consulting criminal" Moriarty. That is what Hannibal felt to me soon after Graham begins working with Lecter. I also thought that Hannibal borrows too much from Dexter. Except that in Dexter's case there is justifiable motive for his actions (okay, kinda...). Has broadcast television ever before attempted a series focusing on a villain? Nothing comes to mind but Dexter has proven such a thing is possible. Hannibal's Lecter however is a persona dependent upon those around him more than the character's own deviousness and depth of history. Mikkelsen is an arresting delight to behold as Dr. Lecter. But for how long can viewers be expected to buy into that on its own merit, absent Lecter being a dark force of nature for his own twisted sake? Personally, I have to question the decision to set Hannibal in the present day, rather than what should have been the Nineteen-Seventies (the period of the novels in which Hannibal Lecter is active and eventually stopped by Will Graham and Jack Crawford). It's the same concern I've had with A&E's Bates Motel, but considerably greater. In retrospect it was a bad idea for Thomas Harris to explore and reveal Lecter's childhood and early adult years with such vivid detail in his 2006 novel Hannibal Rising. Yet I've always been fascinated by what should have been fleeting glimpses of the experiences which molded such a promising young man into a legendary monster: the butchering and devouring of his sister by fugitive Nazi soldiers, his coming-of-age in postwar Europe, his multi-disciplinary medical training, etc. No person comes from a vacuum and there is a load of back story for Dr. Lecter that could have... should have... been allowed to be touched upon. Was NBC trying to make Hannibal more consumable (no pun intended) for a modern audience by bringing the character ahead forty years? I don't know... but it would have been worth a gamble and in my mind, there was a tremendous payoff to have been had. Hannibal is, technically and dramatically, gripping television. Unfortunately in my estimation it misses the mark on being true Hannibal Lecter. Series developer Bryan Fuller could have just as well crafted this drama with a new set of characters absent any referencing of Thomas Harris' books and it would still be "Must See TV". Simply slapping the "Hannibal" label on it however does not make it Grade-A meat. It´s about the last Hannibal Episodes.